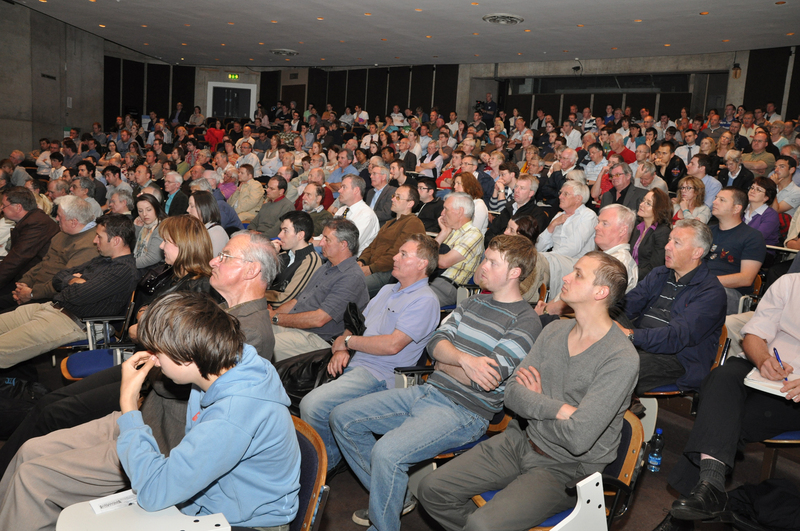 We got a massive turnout on Monday evening for a public lecture I gave on the Large Hadron Collider at Trinity College Dublin. 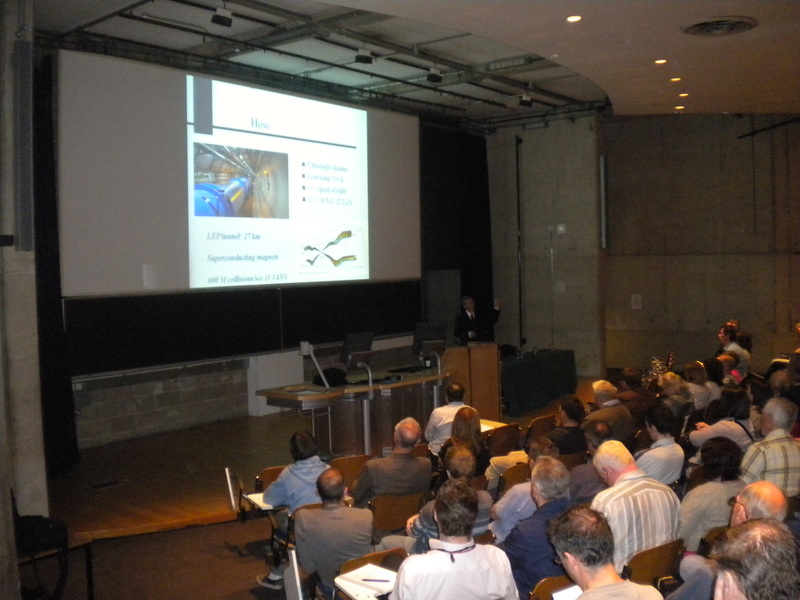 I was invited to give the talk by Astronomy Ireland and it was a great time to give it as there is still plenty of interest in the Collider because of the black hole ‘controversy’, and because last week saw the first offical conference on results from the LHC. Indeed, there has been very little media attention given to the fact that, in the space of a few months, all four detectors at the LHC have been busily rediscovering the elementary particles of the Standard Model that took so many years to first detect, from pions, muons and kaons right up to W and Z bosons. A lot of physicists might have a problem with the populist title ‘Black holes, the Hadron Collider and the God particle’; however the title was worked out with Astronomy Ireland, an organisation that knows a thing or two about attracting a wide audience! Also, I think controversies such as the black hole controversy are best tackled head on i.e. by describing early on in the talk what a black hole is and why one doesn’t expect to create one at the LHC (in particle physics, one gets only a minute amount of mass from a very large amount of energy since m = E/c2 ). I also touched on micro-black holes and Hawking radiation; overall I had the distinct feeling the audience enjoyed this part of the talk no end! As for the term ‘God particle’, I happen to be one of the few physicists who likes this name for the Higgs boson. 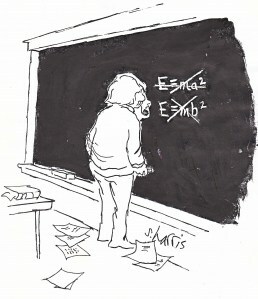 Yes, it was probably originally ‘that goddamn particle’ due to its elusiveness, but I think ‘God particle’ neatly gets across the importance of the particle; after all it is the interaction of the other particles with the Higgs field that is thought to determine their mass, according to the Standard Model. 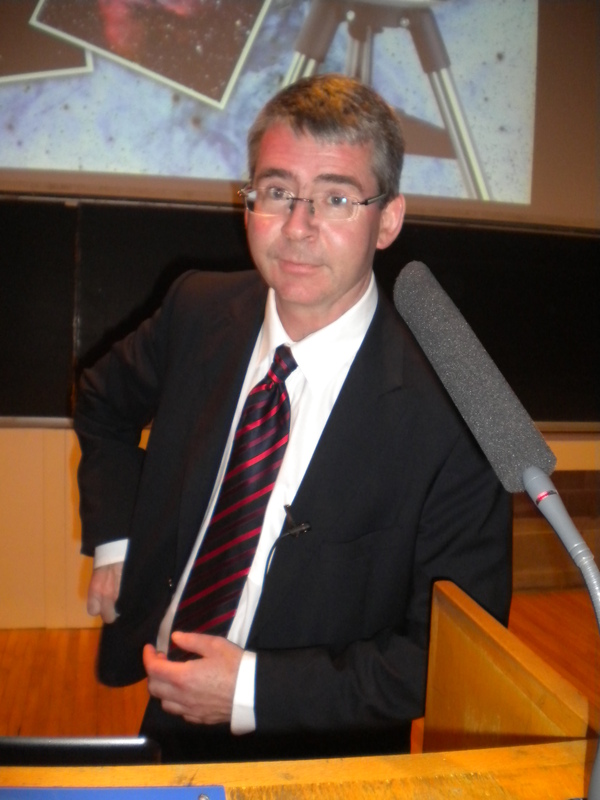 I divided the talk into three parts; first, an overview of the LHC – how, what, why etc. Then I devoted the central part to a brief history of particle physics, from the discovery of the nucleus to protons and neutrons, from the hypothesis of quarks to the electroweak interaction and the Standard Model. 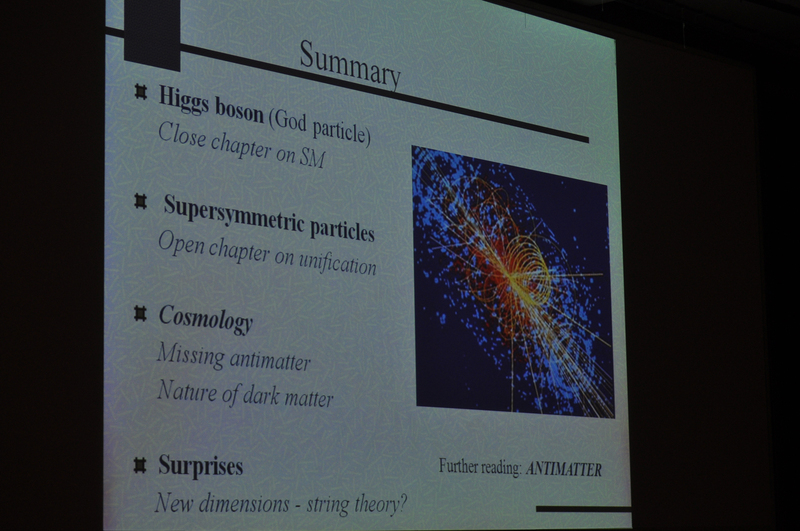 In the third part, I described extensions to the SM such as supersymmetry and Grand Unified Theory and went over our expectations of the LHC experiments, from the possible detection of the Higgs boson to supersymmetric particles, from candidates for dark matter to the search for assymetries in matter/antimatter decay at LHCb. 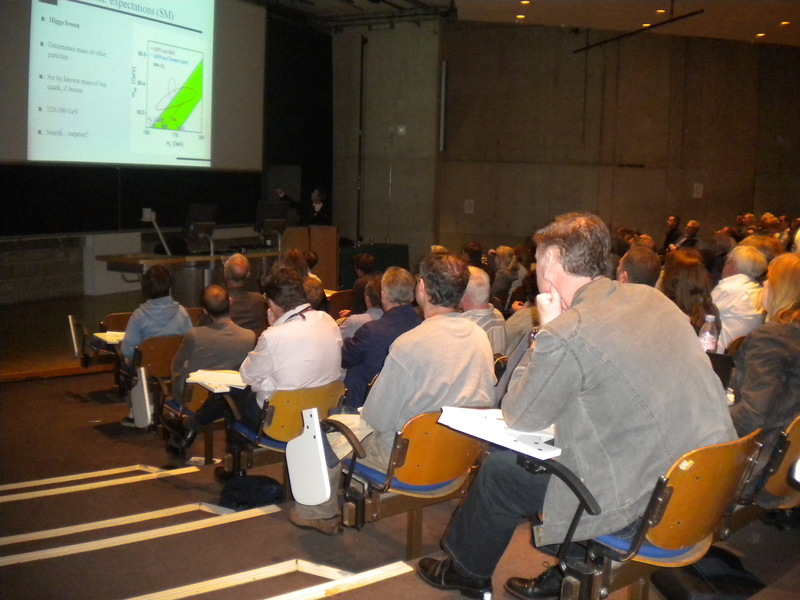 The LHCb experiment is of particular interest to an Irish audience, as a group at University College Dublin are heavily involved, despite Ireland’s non-membership of CERN. Finally, I can never resist showing a couple of slides on the basics; not only do experiments at accelerators give us information on the elemental structre of matter and the interaction of the fundamental forces, they also give us supporting evidence for our underlying theories of modern physics, from the observed mass-increase of particles (predicted by special relativity) to the detection of antiparticles (predicted by quantum theory). You can see the full set of slides for the talk here and a video is available here. I really enjoy giving such talks on particle physics, there are so many fascinating subjects to cover; special relativity, quantum theory, quarks, the fundamental interactions, symmetry breaking, antimatter, dark matter etc. Yet while there are quite a few excellent books for the public on cosmology, there are remarkably few on particles physics… might be fun to try to put one together one day. Apparently, U.S. newspapers are full of stories on the discovery of the God particle at the Tevatron. It seems these stories are based on an unpublished paper (see discussion on Not Even Wrong) – I wouldn’t pay too much attention just yet. Did anyone video the talk? If they did, or if you know of a link to a youtube video of the talk, that would be really great. 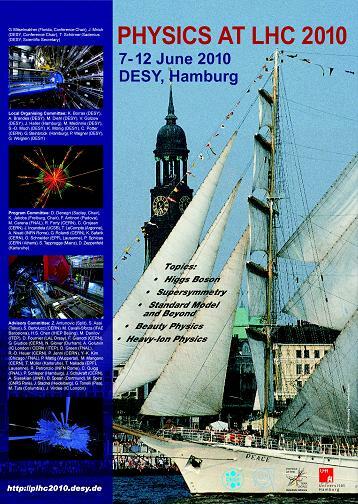 I have not heard about any results yet coming out of the LHC since the “First Physics” Event a few months back. Thanks for the link Dr O’Raifeartaigh. Your man from astronomy Ireland is selling the talk as a DVD video. It would cost him nothing to upload it to Youtube where it would get a large audience of interested people. But i heard that about him before, he does nothing for free and gives no help to the amateur astronomy clubs around the country who look for help with stuff. Thanks, i will watch the interaction.org website for news! Don’t suppose that you’ve a special discounted price on the video for fellow Glenwalk members? Hi Miriam! I’m afraid the videos are not mine to give as they are the property of Astronomy Ireland. Anway, I look like a dork – the slides are more useful! John: that’s not a bad idea! I’ll talk to dvid, see if I can persuade him to put a segment on Youtube..
ENTROPY. Gravity. Star formation. / My opinion /. as a ” surprising abstract “. entropy monotonous increasing law remains open “. nobody knows, what “entropy” basically is “. ” Clausius is right. But I can add more to his entropy conception. at thermal equilibrium (in the state of thermo death) all the time. Thermodynamics ” is not completed, is not final. Please, look at the graph of the radiation curves of the ” black body”. problem be studied in the same way as Maxwell’s ideal gas…. is energy divided per temperature. So the formula hv = klogW is hv = kT logW I think. Which process does formula (hv = kT logW ) describe ? In 1900 Planck followed Boltzmann’s method of dividing. black body (M. Laue called this model as Kirchhoff,s vacuum). the particle /electron, which has energy: E = hv (hf). Which process does the formula (hv = kT logW ) say about ? ( P. Kapitza , L. Landau , E.L. Andronikashvili theories). Thanks to Entropy the homogeneous Vacuum is broken. Thanks to Entropy the stars formation takes place. Thanks to Entropy ” the ultraviolet catastrophe” is absent. Thanks to Entropy our Milky Way doesn’t change into radiation. Thanks to Entropy the process of creating elements takes place. Thanks to Entropy the process of evolution is going. One physicist said :” The entropy is only a shadow of energy“. And this law is not the simple accounting solution of debit and credit. The sense of this law is dipper and it says more than is usually accepted. It took me about three months to write this brief article. I am not a scientest, but the title of this post drew me to this page in a Google Search. I always wondered if there were some particle that brings order to chaos. But if so, then why would God hide from us ? Or why would he want to be worshiped, and send us to hell if we don’t. If I were God, and could make the entire universe, why would I care if some mammals who have never seen me believe in me, or not. What do you think about my following views? scientific understanding of the Universe. among themselves, brought the creation into being. current are non polar entity and electromagnetic force is bi-polar. of Sat Lok and region below to it only. Infinite expanse of gravitational force field is the region of dark energy. was with God; and the Word was God. strong nuclear force. NIRANJAN is the fourth Fundamental Force i.e. strong nuclear force and gravitation – all had the same strength. gravitational force till today. It is a mysterious force.